Get ready for some serious summer beats. 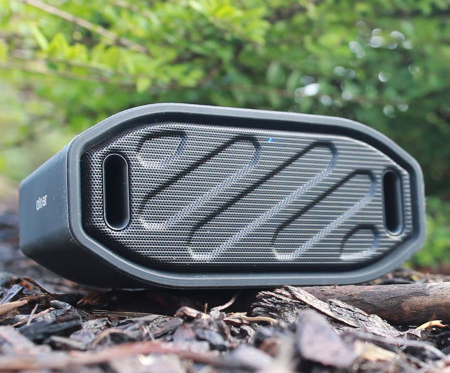 Our friends at Mobile Fun are giving you the chance to win a rugged Olixar Toughbeats bluetooth speaker, so you can take to the pool, patio or porch, while enjoying the soundtrack of your choice. The speaker is designed to be used outdoors, with up to 6 hours playing time when fully charged, and splash-proof casing. The super chunky speaker’s tough build also makes it an ideal choice for camping and festivals, as its tough exterior is well suited to facing the elements. It can be paired with any compatible Bluetooth device such as a smartphone or laptop for streaming music, and can even use it to make hands-free calls. Compact and portable, it’s the ideal travelling companion, and it’s simple to charge via USB. Take a look at this round-up of portable speakers for more information on the Toughbeats. Alongside a comprehensive range of wireless speakers and other bluetooth devices, Mobile Fun stocks all the extras you could possibly need in your mobile world – from accessories for the Apple Watch to all the latest smartphones from Samsung, Apple, HTC and more, as well as tablets, and charging devices. All of these can be delivered to a handy CollectPlus store near you, and sent back from the same location if you need to return an item. 1. Only open to UK residents aged 18 years or over. 2. This prize draw excludes CollectPlus or Mobile Fun employees, their families, agencies, or anyone professionally connected with the promotion. 3. The prize draw runs from 11:00 am on Monday 6th July 2015 to 18:00 on Monday 20th July 2015. 4. There will be one prize of: 1 x Olixar Toughbeats bluetooth speaker. There will be one winner selected. No cash alternative is available and the prize is not transferable. By entering, participants will be deemed to have accepted and be bound by the rules. All entry instructions form part of these Terms and Conditions. In the event of unforeseen circumstances the Promoters reserve the right to offer alternative prizes of equal value. 5. Entrants must have signed up to the MobileFun.co.uk newsletter by entering their email address into the entry form on this page. 7. Only one entry per Twitter account will be accepted. 8. The winners will be drawn at random by Monday 20th July 2015 and announced on Twitter either on the same date or at a later date. The winner will be notified that they have won the prize draw by direct message [on Twitter] and must respond to this notification within 5 days, otherwise the right to claim the prize will be lost and the promoter reserves the right to re-award the prize. 8. By taking part in this prize draw you agree to @collectplus posting a public tweet stating the prize draw winner’s name. 9. The promoter reserves the right to amend, alter or terminate this promotion at any time due to circumstances beyond its control. The promoter’s decision is binding in all matters. 10. The winners’ details (name and county) will be made available on request to those enclosing a stamped self-addressed envelope to CollectPlus, 49 Clarendon Road, Watford, Hertfordshire, WD17 1DU. 11. The promoter can accept no responsibility for, and reserves the right to refuse, entries which are corrupt, incomplete or fail to arrive by the closing date and time. 12. The promoter is Drop & Collect Limited, 49 Clarendon Road, Watford, Hertfordshire, WD17 1DU. 13. These rules are governed by English law and subject to the exclusive jurisdiction of the English Courts. DATA PROTECTION: All the personal information that is taken during this prize draw will only be used in connection with the administration of the prize draw and will not be passed on to an outside company without permission.